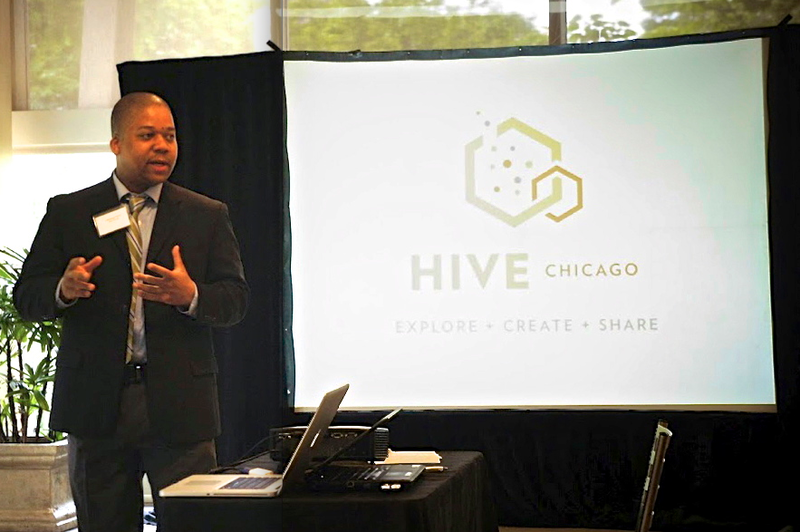 Christian Greer serves as program director for the Hive Learning Network, a group of community institutions in the Chicago area dedicated to transforming the learning landscape and creating opportunities for youth to explore their personal interests through virtual and physical spaces. As program director, Christian is in charge of brokering strong partnerships among participating organizations as well as exploring ways in which those organizations can facilitate connected learning through the design and implementation of innovative after-school and summer programs. Christian also leads major program initiatives relating to badge development, mentoring infrastructures, and network-level youth councils. We spent a few moments with Christian discussing some of the affordances and challenges of creating a network-level connected learning environment in the city of Chicago. The Hive learning network is made up of numerous “learning sites” across Chicago. How do these sites differ from a traditional educational environment? When I joined the learning network project in 2010, I was very excited about the idea of somehow being able to better position myself to facilitate interest-driven learning. Learning sites take learning beyond the classroom. A reason why we chose to focus on out-of-school programs is because during out-of-school time, youth are not mandated to attend any one specific event or program. These are things youth want to do and choose to do around a topic they find interesting. A learning site could be a library, an after-school program, or a 501(c)(3) organization. It could be a YMCA or a museum that conducts on-site or off-site programs. The sites could be located anywhere and we want them to be available at any time. Chicago is a difficult city to navigate. When designing these programs, we are intentional in our use of digital media to repurpose existing programming and create new online programs that can either complement physical spaces or that can act as a stand-alone. How important is youth input when designing these programs? There’s been a huge shift in education over the years, which is partly inspired by research, but a lot of it is has been powered by the kids themselves and the culture they live in today. In order to engage youth as learners and leaders, we have to have a better connection with them. In designing these programs, we really wanted to facilitate and solidify a youth-centered perspective. One of the unanswered questions that we have tackled head-on recently is how we go about elevating youth voice and participation in a way where youth are solidly integrated into what we do. I’m not just speaking of a focus group or two, but creating a larger council, which is always active and that we as program designers can connect with at any time. This experience was a huge deal for the kids. They created a blog and a Twitter account to represent the work they were doing. I see a definite need to develop more of these models of youth councils that elevate youth voice. The youth ambassadors worked hard all summer producing a Tool Kit, which is available for public viewing and provides structure for future youth councils that are looking to take part in creating these programs in a connected learning environment. ￼This is where I see potential. Kamal is the average kid from the south side. He’s not at the top or the bottom academically, so in a way, it was a bit shocking for me to see him at these different programs. In that instant, I felt the power switch. He was in charge of his own learning. He had just as much of a right to ask me what I was doing as I had the right to ask him. The key was empowerment. We are in the midst of breaking down these false silo structures that say subject areas can’t relate to each other, and we are just now starting to imagine what it would look like to develop a trans-network set of skills so that, regardless of the subject area, teens could have a portable framework which they could apply to any type of learning environment they happened to be in at any given time. Chicago is a city of neighborhoods, and even in this day and age, there are hidden barriers that make kids feel unwelcome. Those barriers could be going to a museum, going downtown, or even going to the next neighborhood over. There is also an academic barrier. Many kids don’t want to go the Museum of Science and Industry to participate in a science program because they are doing poorly in science at school. For this reason, the museum programs are not necessarily designed for the A+ type students. They are more about science exploration, inquiry, and literacy than they are about achievement in science. In order to overcome these barriers, organizational members, mentors, and educators have to not only be well versed in their own organization’s programs, but they have to also recognize that they are a representative of a larger network of organizations and be a broker for getting those kids into other programs. That is not an easy thing to do. Individual organizations are so caught up in what they do on a daily basis that they never really think about marketing learning across neighborhoods, disciplines and age levels as opposed to marketing their own organization. When it comes down to it, no one teacher, no one organization, no one parent or teen can be the solution to this very complex system that we call learning in the 21st century. It’s going to require people at all levels from multiple diverse perspectives to somehow think together in harmony to achieve the results we are looking for. What we’re hoping to do with our community is build a professional learning community, PLC, through which we could do some load sharing around this type of program innovation where no one person has to do it all. The Hive Learning Network requires more than leaders’ participation. It requires the kids themselves to stand up, be empowered, and take responsibility for their own learning. If we can create a connected learning environment that fosters the atmosphere for allowing that to take place, there’s potential for this network to break down barriers to orchestrate a new level of success. How has your own background in science impacted the work you do with these youth? I was a lot like Kamal when I was growing up. I was not the greatest student, but I had a very strong interest in science. A subject like physics challenges you at a level that you cannot even imagine. Intellectually there are things you have to know how to do with your mind in order to do quantum mechanics at an undergraduate level. I struggled with those things. I was more interested in it than the average kid in school, but I didn’t have a lot of those skills that were needed. Yet it didn’t stop me from being interested, in part because when I went to the planetarium as a child to participate in programs, the staff welcomed me in. I didn’t have to take a pre-test to see if I was qualified to walk into the building. I didn’t have to rattle off a list of the planets. They told me we were all together in studying our universe. At that time in my life, it was empowering to be around people who shared my same interests, so you can imagine the passion I have doing that now for kids like Kamal. I’ve been in his shoes. I know what it’s like.